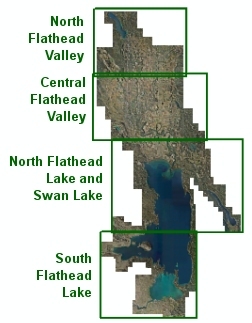 Photographs of the Flathead Basin were taken between September 23 and September 25, 2009. These photos are in MrSID format and Montana State Plane coordinates, datum NAD83, HARN. The horizontal units of the coordinate system are U.S. Survey feet. 8 large (400-750 Mb) images. Click here to download these. 780 individual images that each cover about 700 acres. For this web site, groups of 6 files were placed together in zip archive files. Select your area of interest below to see a map of the files that may be downloaded. These data may be viewed by anyone with our Online Map Viewer or accessed as web services that allow seamless access to the data without the need to download individual tiles. This web site is intended for quick access to data for a small area. If you need this data for a large area sent to you, please contact the State Library.